Ricky and Warwick Davis do a fashion shoot for The Times Magazine and talk about Life's Too Short. Ricky camps it up for the cover shot in The Big Issue - November 2010. Ricky, Steve and Karl talk about 'An Idiot Abroad'. Read the major article here. Insight on Indolence - Ricky tells American Esquire how to conquer the world if you're a fat bloke from Reading. Arrive Magaize provides an extensive interview with Ricky for the edification of the American rail-going public. Boyd Hilton of Heat magazine chats with Ricky and gets a special makeover treat. Entertainment Weekly lists its top awkward TV moments. Ricky features heavily. Entertainment Weekly throws the spotlight on Ricky. Marie Claire sends Janet Street Porter to have a chat with Ricky at the office. Heat catches up with Ricky to find out about the second series of Extras. The Guardian Guide investigates Ricky's fascination with Karl Pilkington, heralding the new series of The Ricky Gervais Show. GQ dubs Ricky "Hollywood's hottest Brit"
In the wake of Channel 4's 'When Ricky Met Larry', Time Out caught up with Ricky for a chat. The star and creator of Spinal Tap chats with Ricky just prior to the start of filming of his new movie 'For Your Consideration' in which Ricky will appear. DVD Review catches up with Ricky for a 5 minute interview. Inside, Ricky seems to have won-over the toughest interviewer in the business. Talk of Live 8 and Extras as Time Out names its number 1 London-based comedian. How does Ricky rate other comedy shows? Uncut asks Ricky to list his Top 10 TV sitcoms. Nice and short, this one. Straight to the point and no long words. This month's 'Attitude' carries an interview with Ricky in the form of a 'How gay are you?' questionnaire. Ricky scored particularly well when asked about the contents of his fridge. The Sunday Times catches up with Ricky to talk about Politics. In its regular 'cash for questions' feature, Q magazine puts a selection of readers' questions to Ricky covering such important topics as teeth, ringtones and darts. - This symbol means that if you read on you may encounter filthy language. Ricky is over 21 and really ought to be able to express himself without swearing quite so much. As it is, his oral cavity remains a stranger to the benefits of soap and water and a decent-sized vocabulary. Heat Magazine gives Ricky a centre-spread to document his hosting of the 2011 Golden Globes. Starpulse ask Ricky about hosting the Golden Globes and who he's rooting for. These are a few of his favourite things... in Time Magazine's regular shortlist feature. Here's an interview with Ricky in Short List about the new HBO animated series. TV Without Pity asks Ricky about the UK and US versions of The Office and TV in general. Ricky talks about hosting the Golden Globes in January. Read his interview at ET Online here. A chat with Ricky about how things might pan out when he hosts the awards in January. Ricky talks about his forthcoming show at Carnegie Hall amongst other things. Review and a chat durng lunchbreak during filming of The Invention of Lying. ...about The Invention of Lying. Jonathan Ross and Ricky talk properly and sensibly. There's a big interview and a review of the movie. Ricky talks about The Invention Of Lying while at the premiere in Toronto. Ricky chats with an antipodean reporter on set in Shepperton Studios. The esteemed movie review website talks to Ricky and Stephen down at the studio during the filming of Cemetery Junction. The Times Online goes behind the scenes for an exclusive first look at Ricky's new movie. BBC1's evening magazine show features Ricky talking about Sunday's showing of The Office. The influential film review web site has a major interview with Ricky and Steve about Cemetery Junction. The popular US magazine got on the phone to talk about Cemetery Junction. Here's a location report from the set of Cemetery Junction. Britain's favourite tabloid paid a visit to Cemetery Junction to probe Ricky about his new movie. London's Time Out magazine visited Ricky and Steve on set at Cemetery Junction recently. Ricky talks in support of coolearth.org climate change campaign. and how his upbringing has influenced Cemetery Junction. and get some early indications of what the film will be like. Entertainment Weekly liked Ricky's thirteenth Letterman. A big graveyard-based interview with Ricky in the Daily Telegraph. New York's Daily News talks to Ricky about his HBO DVD and Ricky questions Elmo's consistency, sartorially speaking. Here's a nice interview with Karl in which he talks about what it's like working with Ricky. The Times Online has an in-depth chat with Ricky about comedy infulences. The Telegraph chats with Ricky about comedy and how there's no such thing as God. The San Fransisco Chronicle sums up Ricky's career. US publication, Black Book Magazine, lists Ricky's top 10 bugbears. Read the rundown here. Read the article here, complete with downloadable audio. Ricky's in the hot seat for a Q&A with TONY. 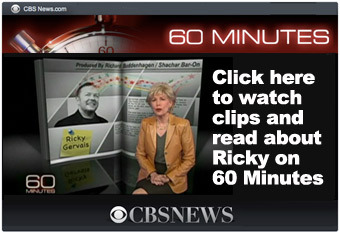 BBC News Online chat with Ricky - Ricky gives his views on where all this technology internet video stuff is going. Glasgow's Sunday Herald has a new interview with Ricky - available online here. Time Magazine's regular '10 questions' feature catches up with Ricky and poses him a number of queries set by readers.